Although dance is a unique form of athletic activity, male ballet training shares similarities with sports training due to the requirements of this dance style. Male ballet dancers train to develop strength, flexibility and the appropriate body composition required for ballet. While a great deal of their training is achieved through ballet classes, dancers supplement these workouts with other types of training to achieve optimal results. Because of the duration and frequency of ballet performances, cardiovascular exercise makes up an essential component of exercise. Professional ballet dancers generally take a daily ballet class, which contributes to their aerobic activity. However, in some cases, male ballet dancers may also run, swim or perform various cardiovascular activities to supplement their ballet exercises. These exercises develop joint and muscle strength, helping to improve performance and decreasing the risk of injury. 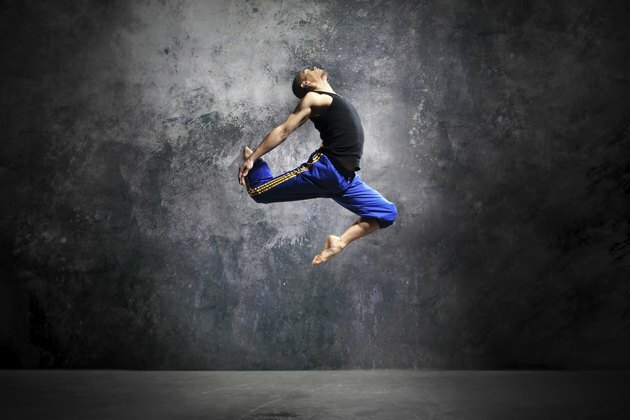 Male ballet dancers require strength to perform lifts and jumps on a daily basis. To execute the powerful moves required of male dancers, strength training makes up an essential part of a well-rounded fitness program. These exercises must be practical so dancers primarily focus on bench and shoulder presses. To imitate the common over-the-head lifts of female dancers that male dancers perform frequently, they may use a shoulder-wide grip on a bar and then press upward, starting from stomach height to above the head. The majority of these strength-building exercises focus on the abdomen and back muscles. Improving strength in these areas helps with lifts and stability. Both male and female ballet dancers must be flexible. However, for males, maintaining joint flexibility is a challenge. Especially in the hip area, males tend to be less flexible than female dancers. To avoid injuries related to flexibility exercises, many male dancers start training at the early age of 8. To maintain their flexibility as they grow up, male ballet dancers may also use flexibility training such as yoga or Pilates. Cardiovascular exercise, strength training and flexibility exercises make up a well-rounded male ballet dancer's fitness routine, but all three types of training must be balanced to create the slim silhouette required of male dancers. To optimize strength without adding bulk, male ballet dancers use heavier weights with fewer repetitions in their workouts. They also focus on compound movements that improve their core muscles and increase stability while dancing. Male ballet dancers perform a well-rounded training program that improves their athletic performance and helps prevent injuries on-stage. Their entire fitness program focuses on creating long, lean muscles with enough strength and agility to remain in top shape for performances.